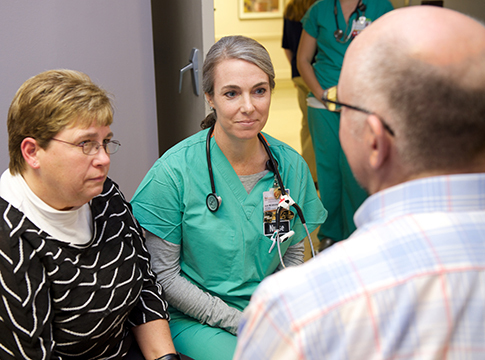 The Fellowship Training Program in Hospice and Palliative Medicine at the University of Iowa seeks capable humanistic physicians from all of the eligible boards to join our academically and clinically rigorous training program. As Iowa’s only academic tertiary medical center, University of Iowa Hospitals & Clinics provides the venue to train physicians from multiple specialties. We welcome physicians from multiple specialties including surgery, radiation oncology, internal medicine, family medicine, pediatrics, anesthesia/critical care, emergency medicine, neurology/psychiatry who desire to develop skills caring for the unique needs of patients with serious illness. The principal goal of our program is to provide the trainee with the clinical knowledge and judgment, professionalism, interpersonal skills, and abilities necessary to become a leader in hospice and palliative medicine. Fellows will train with multiple interdisciplinary teams, work with pediatric and adult patients and their families, and gain skills in the comprehensive care of patients in inpatient, outpatient and home settings. Discover what makes our community a great place to call home. Our stipends and benefits compare with top programs in the country. Contact GME staff with questions about our programs.